Finger vein image retrieval is a biometric identification technology that has recently attracted a lot of attention. It has the potential to reduce the search space and has attracted a considerable amount of research effort recently. It is a challenging problem owing to the large number of images in biometric databases and the lack of efficient retrieval schemes. We apply a hierarchical vocabulary tree model-based image retrieval approach because of its good scalability and high efficiency.However, there is a large accumulative quantization error in the vocabulary tree (VT)model that may degrade the retrieval precision. To solve this problem, we improve the vector quantization coding in the VT model by introducing a non-negative locality-constrained constraint: the non-negative locality-constrained vocabulary tree-based image retrieval model. The proposed method can effectively improve coding performance and the discriminative power of local features. Extensive experiments on a large fused finger vein database demonstrate the superiority of our encoding method. Experimental results also show that our retrieval strategy achieves better performance than other state-of-the-art methods, while maintaining low time complexity. Kun Su received her BS degree in computer software and theory from the School of Computer Science and Technology, Shandong University (SDU), China in 2001, and MS degree in computer software and theory from Kunming University of Science and Technology, China in 2008. Su is currently a lecturer in Shandong University at Weihai, China. She is also a PhD candidate in the School of Computer Science and Technology, SDU. Her main research interests are biometrics and machine learning. Gongping Yang received his PhD degree in computer software and theory from Shandong University (SDU), China in 2007. Now, he is a professor in the School of Computer Science and Technology, SDU. His research interests are biometrics, medical image processing, and so forth. Lu Yang received her PhD degree in computer science and technology from Shandong University, China in 2016. Now, she is a lecturer in School of Computer Science and Technology, Shandong University of Finance and Economics, China. Her main research interests are finger vein recognition and biometrics. Peng Su is an associate professor in the School of Mathematics and Computer Science at Dali University, China. His research interests mainly focus on data mining and business intelligence. Dr. Su obtained his PhD degree in computer application technology from the Chinese Academy of Sciences, China in 2011. He received his MS and BS degrees in computer science from Shandong University, China. He is a member of IFAC Technical Committees on Economic and Business Systems (TC9.1) and regularly serves in program committees at international conferences such as IEEE ISI. Yilong Yin is the director of the Machine Learning and Applications Group and a professor with Shandong University, China. He received the PhD degree from Jilin University, China in 2000. From 2000 to 2002, he was a post-doctoral fellow with the Department of Electronic Science and Engineering, Nanjing University, China. His research interests include machine learning, data mining, and biometrics. 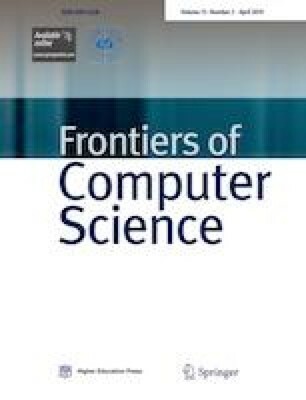 Supplementary material is available for this article at https://doi.org/10.1007/s11704-017-6583-x and is accessible for authorized users. This work was supported in part by the National Natural Science Foundation of China (Grant Nos. 61472226, 61573219 and 61703235), and in part by NSFC Joint Fund with Guangdong under Key Project (U1201258).